Enjoying the high life in Gothenburg, Sweden’s second largest city, without breaking the bank takes a little discipline and a lot of imagination. 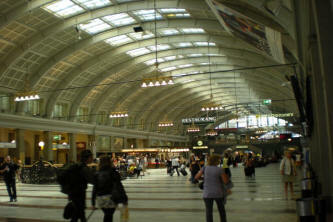 There’s no doubt about it: I had traveled to Gothenburg in first class; once I got there it was back to reality. I’d just arrived from Stockholm on the X2000, Sweden’s high-speed train that reaches speeds of up to 125mph (200km/h) and ferries travelers between the two cities in a mere three hours. The downside is that the ticket costs about as much a discount airline ticket; the upside is that you’ll feel like you’re flying first-class. A few hours before, after helping myself to a glass of fresh juice and some fresh fruit from the á la carte kiosk, I settled into my plush, la-z-boy-sized chair, rolled it back to a comfy 45- degree angle, and watched out the window as the lush, green Swedish countryside quickly passed me by as I zoomed south to Gothenburg. It’s these moments of travel that I look forward to the most: those rare moments during your trip, usually on your way from someplace to somewhere else, when you’ve got nothing better to do than to just sit back, relax, and replay the events of the last few days in you head. This usually happens after a hectic spurt of activity — in my case a couple of days running around Stockholm seeing the sights by day and heading out afterward to enjoy the nightlife, followed by an overnight ferry to Tallinn, Estonia, then back again. In those past 96 hours I’d pretty much utilized every form of transportation that doesn’t involve a four-legged animal — plane, bus, taxi, subway, ferry, ocean liner — but I have to say there’s probably nothing better than traveling by train. I realize it’s a cliché, but there’s some sort of aura around train travel that allows you to imagine that for a brief period of time, you’ve transported back to a bygone era when travel was slow, methodical, and unbureaucratic — a time before cramped airplanes, hectic terminals, and dirty buses. Like almost nowhere else, its feels natural on a train to sit by yourself and write in your notebook or to stare out the window and listen to the rhythmic thudding of the wheels on the track while thinking about life. Conversely, on a bus the only people you’ll see writing furiously in a notebook or staring out the window in deep thought are usually accompanied by a member of the psychiatric community. The pale, grey sky near Stockholm had turned a menacingly charcoal color when I arrived in Gothenburg. I strapped on my oversized backpack, took one last look at what would probably be my most comfortable mode of transportation for the rest of the trip, and ventured out into the heavy downpour. I read that the hostel that I was hoping to stay in was roughly 10 minutes from the train station and was accessible via Gothenburg’s main form of transport, the streetcar. Called the Tram, Gothenburg’s light rail system is the largest in Northern Europe — a fact that became all too apparent to me as I looked at the train map with its technicolor jumble of squiggly lines and impossibly long station names like Medicinaregaten and Sahlgrenska Huvudentre. Naturally, I hopped on the first one that would get me out of the rain. Somehow, I miraculously managed to find my way to within a couple stops of the hostel where I was able to hike it the rest of the way. The next morning the rain had stopped but there was still no sign of the sun. Gothenburg’s protected location on a river close to the North Sea has played a big part in the city’s maritime past both strategically as well as commercially, but it also means that the city gets a mean cold breeze that blows in from the bay. Why did I bring only short-sleeve shirts on this trip and why had I not come in late July instead? I meandered around the pedestrian-only streets that make up a bulk of downtown, ducking occasionally into a one of the many stores there to warm up, then I headed to the water’s edge to the Gothenburg Maritime Museum, a flotilla of anchored boats that claims the title of the world’s largest floating ship museum (how many are there anyways?). Here you’re given free reign to roam around its many boats and to delve into the hulls of old fishing boats and various de-commissioned remnants of the Swedish navy including a mid-sized destroyer and even an old U-boat. Note to professional basketball players and/or most of the population of Scandinavia: despite my lack of height, even I bumped my head not once but twice in its narrow passageways — you’ve been warned. Nearby is the Gothenburg Opera House, a behemoth of a structure that seats up to 1,300 people and is large enough to house the opera’s 2,000-plus staff working on everything from building sets, sewing costumes, and selling ticket subscriptions. 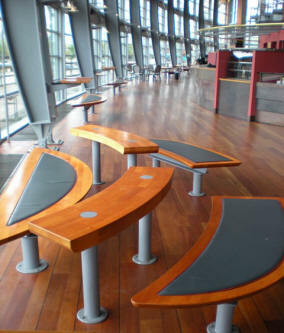 Finished in 1994, the building was designed with a nautical motif in mind, including an interior design that curves inwards like the hull of a boat and pinewood flooring meant to resemble a ship’s deck. When I arrived I joined a tour that had just begun. “Does anyone speak English in this group?” the guide asked the assembled group shortly after I joined. I sheepishly raised my hand, reluctant to admit my American ignorance of foreign languages. “It’s no problem, I’ll say everything in both Swedish and English,” he said accommodatingly. “Really, it’s no problem,” he insisted. Me: smiling and nodding occasionally as if I knew what was going on. That evening I met up with a friend who grew up in Gothenburg and we headed out to Linnégatan, the popular avenue stretching from the edge of downtown through the posh neighborhood of Olivedal. 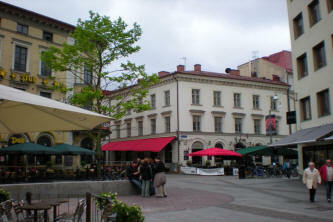 Along this street are some of the city’s best restaurants and bars and this area is also a hot destination for nightlife, especially when the 50,000 or so students attending the University of Gothenburg come back to school in the fall. We had dinner at La Sombrita, a tapas restaurant with a large selection of Spanish wine and a heated patio in the front for those cool June nights, then we wandered further down the street, stopping into various pubs along the way. I’m the first to admit that I’m not much of an outdoorsy traveler, but I’ll make a concession if that piece of wildlife happens to be plopped in the center of a large metropolis — Central Park for example — or in Gothenburg’s case, Slottskogen, the sprawling park just minutes from Olivedal. Early the next morning, after a short stroll on one of the many nature trails in the park, I headed to the center of the park where there’s a zoo designed to resemble the northern countryside of Sweden. A stroll around the grounds allows you to observe such various specimens of wildlife including elk, reindeer, moose, as well as hordes of wandering school children taunting said elk, reindeer and moose. To make up for the punishment that I was giving my feet, I decided to give them a rest by taking one of the many boat cruises that travel through the city’s canals and out into the harbor to the giant shipyards that once fueled Gothenburg’s economy before the industry moved out in the late 1970’s. Once out into the bay, I spent most of the ride shielding myself from the constant splash of the waves by hiding behind a group of German tourists, while occasionally popping up to record some video footage for the site. I think that I’ve experienced enough of the outdoors for one day, I thought to myself as I wiped water off my sunglasses. I met up with my friend again that night and we headed to the eastern part of town to Heaven 23, the stylish restaurant/skybar atop the 23rd floor of the Gothenburg Convention Center which looks out over Scandinavia’s largest amusement park, Liseberg, as well as over the rest of the city. 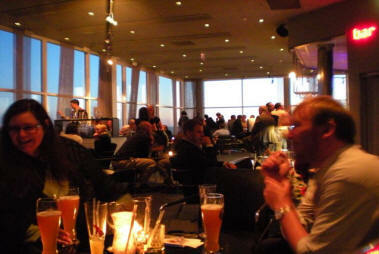 The bar was crowded with a mix of well-dressed 20-somethings and groups of businessmen and women. 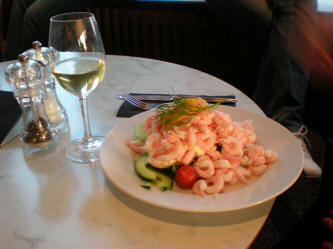 We ordered the restaurant’s signature dish, a traditional salad that comes out piled high with succulent, fresh shrimp. “You know, this is quite luxurious of us to be eating an expensive shrimp salad for dinner,” my friend said, popping one of the oversized shrimp in her mouth. “I know,” I responded, thinking about my quickly diminishing bank account. “I think I’m going to have to save money and take the normal train for the rest of my trip.” The good times had to end sometime, I thought. At least I’ll always have the X2000.